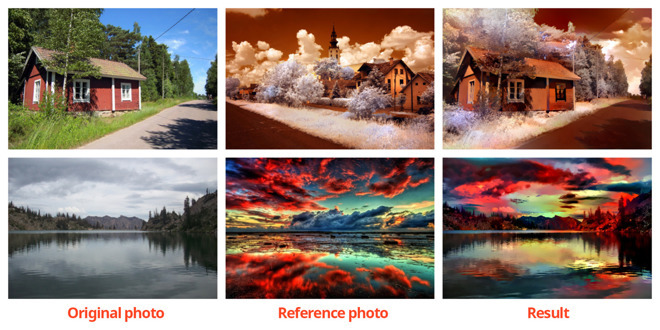 The paper for Deep Photo Style Transfer describes the use of deep learning methods to analyze elements of a reference photo, acquiring information on the time of day, colors, weather conditions, and other items, reports The Next Web. This style can then be applied to a second image, changing elements to make it similar to the first, such as editing a dusk cityscape to one that appears to be an image captured in the middle of the day. The researchers based their work on earlier algorithms that used a painterly transfer via a neural network, in a similar way. A Neural Style algorithm was then used on a target image to apply the style, but introduced various distortions into the image, making it unsuitable for photorealistic style transfers. The researchers fixed this by constraining the transformation to be locally affine in colorspace, and to apply it as a custom layer that can be further adjusted. This approach successfully suppresses distortion and yields satisfying photorealistic style transfers in a broad variety of scenarios, according to the paper. The recently-published paper does indicate Adobe is working hard to introduce artificial intelligence into its tools in the future, though it may not appear in Photoshop for a while, until Adobe can perfect the software's capabilities. In the meantime, code from the research has been made available to download in Github, so interested users can try out the tool for themselves. Adobe's existing tools already use machine learning and AI in a limited capacity, announcing in November last year that it was introducing tools to automate tasks and provide extra assistance, powered by the Adobe Cloud Platform. For example, Adobe Sensei will help users in Stock Visual Search and Match Font, while the Liquify tool in Photoshop will be made face-aware. The company has also teased the use of a voice-based assistant for basic image editing tasks. A proof of concept video showed a user cropping and flipping an image before posting it to Facebook, all by speaking to an iPad app. Adobe believes it may be some time before such an assistant will be available for use by its customers.